This cabin near Twisp, Wash., is packed with ideas for small-home living, from its open rooms, multiple levels, creative details, and outdoor living rooms. 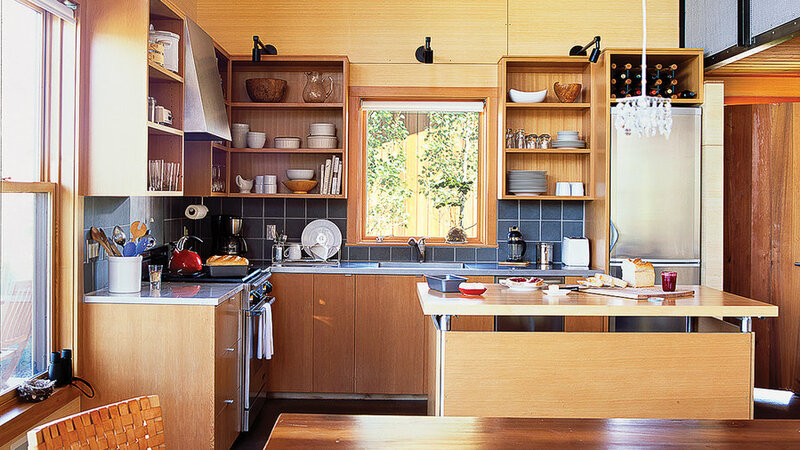 Ray and Mary Johnston of (206-523-6150) designed the 1,200-square-foot cabin for their family of 4. 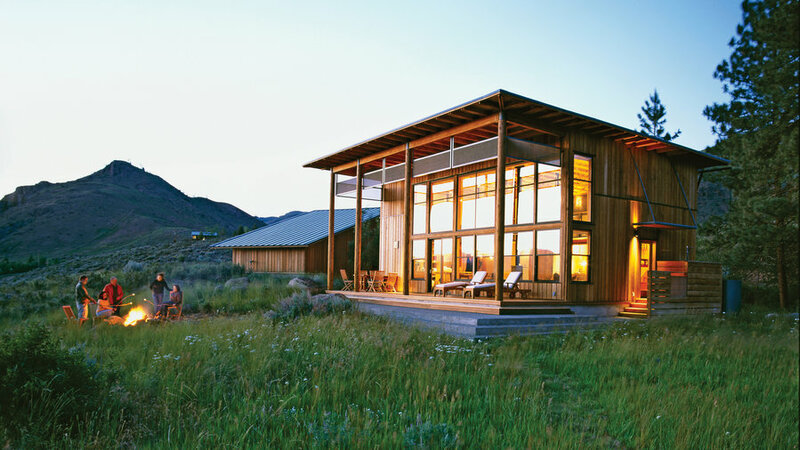 Every part of it is oriented toward the floor-to-ceiling windows that frame the mountain view of Washington's Methow Valley and the Cascade Sawtooth Mountains. See how the Johnstons got the most from their square footage. Living space doesn't have to mean four walls and a ceiling. The Johnstons think of the veranda as another room. 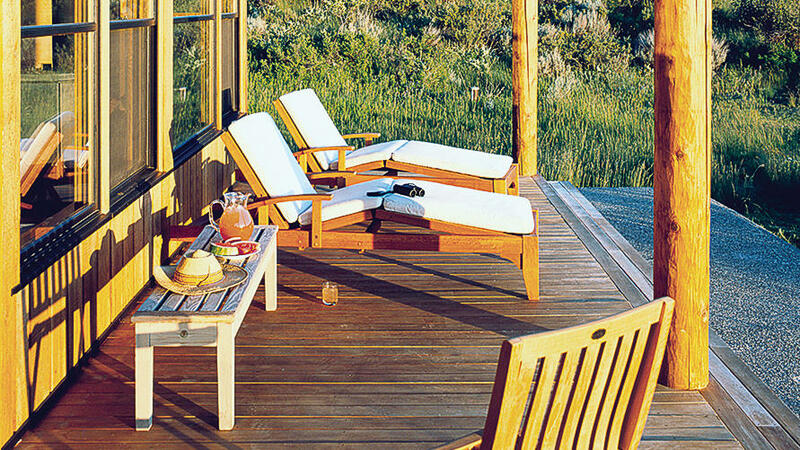 "The concrete steps off the veranda extend the house further," Mary explains. "And in the summer, people sit on the granite rocks below." "I love my kitchen," says Mary. "It's small and open and really efficient." One of the couple's favorite things is the appliance-free island they made from a stainless steel and butcher block workspace they bought at a restaurant-supply store and covered on three sides with plywood. "It was incredibly inexpensive, and it's become one of the central gathering spots in the house," she says. "Spatial economics is the idea that you should be able to live within the radius of your interaction," says Ray. In other words, no extra rooms and no wasted space. "In a small space, the most satisfying thing is variety," Mary says of the built-in bookshelf on the wall above the staircase. The inviting alcove is both a convenient throughway and another place to hang out. This area can't rightly be called a bedroom, so the Johnstons call it the "bed cabinet." It's a foot larger than a queen-size bed on every side. "We were a little experimental," Ray says. Unless there's company, the doors are left open to the view. The sleeping loft above the living room creates more spaciousness.